October 1934. Pic courtesy of Mirrorpix. 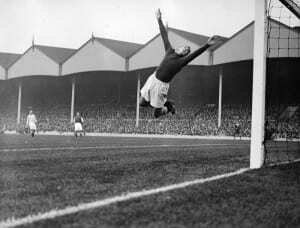 An FA Cup and League Championship winner for Manchester City in the pre-war period, Frank Swift was one of the most highly-rated 'keepers of the era, appearing regularly for England during and after World War Two. Making his City debut on Christmas Day 1933, just before his 20th birthday, Swift had a run of over 200 consecutive appearances for the club. During the 30s, City were an entertaining if inconsistent proposition; they followed their Division One title win in 1937 with relegation to Division Two in 1938 (despite scoring the highest number of goals in the league). While Swift played behind a defence that frequently conceded chances, his personal reputation continued to grow, and he became an England regular during and after the war. Swift was part of the Army School of Physical Training during World War Two; one of several top professionals who joined at the time, and played over 100 wartime games for City, as well as guest appearances for many other sides. After retiring from football when still near the top of his game, aged 35, Swift became a sports journalist. He was a passenger on the ill-fated flight back from Munich on 6 February 1958, having reported on Manchester United's European Cup semi-final tie with Red Star Belgrade. He died aged 44.